We use only top quality shingles at Southern Roofing Company. We know that when you choose us for your roofing job you're looking for quality that stands the test of time. We select our shingles based on testing, real world applications, and the best user reviews like you would when searching for items you'd install yourself. Our offerings are all "Top Shelf" but at prices everyone can afford. There are several grades of all the shingles listed, so we'll link to the manufacturers website so you can browse selections you'd like to see in your application. The GlassMaster® fiberglass 3 tab shingle offers exceptional performance and value while providing long-lasting durability. GlassMaster® roofing shingles provide homeowners proven durability combined with an appealing traditional look. Virtually any color scheme requirement can be satisfied by Atlas’s wide selection of designer colors. A 30-year limited warranty and unmatched quality standards make the GlassMaster® shingle a clear and sensible choice for value in a traditional 3 tab shingle. GlassMaster® 3 tab shingles provide 60 MPH limited wind warranty protection to ensure the integrity of your home against the elements. GlassMaster is an algae resistant shingle in most colors to help inhibit algae growth over the life of your roof. If you are searching for quality, traditional beauty and affordability, look no further than GlassMaster®, the fiberglass original 3 tab shingle. Whether you need to match the classic style of a heritage home or add contemporary class to a modern residence, Cambridge architectural shingles make roof replacements an exciting endeavor. Find the color scheme you imagined and increase the beauty of your home with this impressive selection of unique and subtle colors. Choose a trusted contractor: look at IKO’s list of approved, professional certified roofers. Pinnacle® Pristine featuring Scotchgard™ Protector shingles now come standard with the power of Scotchgard™ Protector to defend against algae streaks and help retain original color. To find out more about Scotchgard™ Protector, click below. The Pinnacle® Pristine featuring Scotchgard™ Protector premium shingle is at the top of its class. It is a true laminated architectural shingle, featuring distinct shadow lines that provide the added dimension (multi-layered shingle) of a wood shake appearance. Full random cuts ensure that the appearance of undesirable patterns will not occur. Pinnacle® Pristine featuring Scotchgard™ Protector also offers an algae resistant feature to further increase the lasting beauty and elegance of your roof. A wide variety of shingle color options ensure a perfect complement to any color scheme. Pinnacle® Pristine featuring Scotchgard™ Protector promotes beauty, elegance, lasting performance and peace of mind with its transferable Lifetime Limited Warranty* that is unmatched in the industry. The shingle color you choose is the color you'll keep. What Makes Pinnacle® Pristine Featuring Scotchgard™ Protector Such A Great Choice? 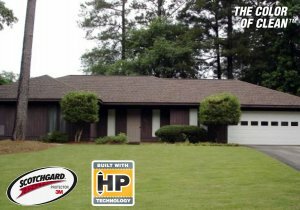 Simply put, once you choose Pinnacle® featuring Scotchgard™ Protector and Pro-Cut® Hip & Ridge featuring Scotchgard™ Protector, you will never need to worry about algae growth on your roof ever again. Premium Protection Period is the initial non-prorated labor and material coverage for your new roof. With an Atlas Signature Select® system, you get unprecedented coverage for your new roof. Pinnacle® Pristine HP shingles, are designed with both the contractor and the customer in mind. Five significant features are the reasons why Atlas Pinnacle Pristine HP is the High Performance shingle: Scotchgard™ Protector, Lifetime Limited Warranty, 15-year Premium Protection Period, 130 mph Limited Wind Warranty, and the Sweet Spot™ installation method. A high performance roof begins at the point of installation. The Atlas Pinnacle Pristine HP shingle offers roofing contractors true ease of installation with Sweet Spot™ technology that allows for a true 1¼” wide nailing area. Sealant Lines Assure Quicker, Better Seal Down.